Well, where to start! only been 4 more days but so much has happened since then it seems ages. We explored delhi on mondawith our guide sunil kumar a very nice chap if little smelly. had a slightly bizarre experience when katy perry i kissed a girl came on the radio as we were driving around old delhi. Saw the sights which were all pretty impressicve but couldnt believe the conditions that some people were living in, ignoring beggars is incredibly hard.On the night our two indian friends took us for a meal turned out one of thems dad controlled DHL for India so he was loaded and the meal was on him in a 5 star hotel overlooking new delhi. The next day left delhi for agra, stopped on the way where laura had her first experience of indian tea..... never again.stopped off at lord krishna's birthplace very spiritual but not a very nice place lots of hassle which we're getting used to now, people seem to stare and take photos of us like we're celebrities here.Just outside of agra we visited a palace,which was really laid back wild deer grazing and loads of monkeys which we fed and were stalked by a group of 14 year old boys who all wanted seperate photos with us, again something that we're getting used to. We were determined to be as independant as possible in findign our accommodation, sunil was not happy with this there was no road to the hostel of our choice so he dropped us on a busy road where we were immediatley swarmed by tuc tuc drivers all fighting to take us. just to add to the stress a sewage pipe burst and we found ourselves standing in flipflops in a river of wee, not the nicest experience.at this point we caved and allowwed sunil to take us to his hotel. 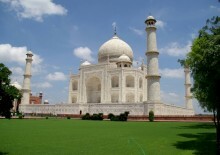 we were up at the taj mahal for 6 a.m, watched the sunrise over it was amazing but jam packed even at the crack of dawn. we then got the hell out of agra because it was a complete dump. Next stop was at Bhoratpur, where we really did stand our ground and insisted we went to the hostel we had choosen from the guide book/bible (sunil HATEs our book) definately worth turned out to be really friendly,family run and nice garden with a dog called noddy! Bhoratpur is famour for its national park which is a top 10 must see of india, did not let us down, we spent the early evening to dusk cycling ( if you can call them bikes) through the park, was definately worth the sore bums. saw tree fulls of stalks and migratory birds, monkeys, hyenas, antelope,deer and plenty of cows. We were all very content that evening. Next stop was Jaipur,where we are now. Stopped on the way at a monkey temple which was a pilgramage site for indians so was packed, watched them bathing in the sacred water. they were all dead friendly, we can tell the difference in the people already much freiendly and easier to trust. Arrived at hotel pearl palace in Jaipur, best by far. Really quirky with rooftop restaurant views over the city. On the night we decided to go see a bollywood film at the most famour cinema in india, housing 1900 people in one screening. the film was gomaal returns which was apprently a comedy (indians have a strange sense of humour considering the last scene was every member of the ccast trying to hang themselves and randomly broke out into dancing in cowboy outfits, the whole cinema was in hysterics and cheering, we were also but for very different reasons! )definatley an expericence we reccommend. Had dinner on rooftop and had drinks sat on cushions watching fireworks. Saw the sights of Jaipur, one that has stuck in our mind is the hideous 360 step climb in midday heat up to a temple which turned out to be closed and instead we were followed by a group of school boys shouting you are beautiful and he is very very idiot. views were stunning though, still worth it. went sghiopping for the first time, was great fun having the shopkeepers destroying their shops trying to find something we would pay money for and haggling. Becca was in her element obviously. we're now all now kitted out indian/traveller style with long skirt, tunic top and crazy aladin type trousers (guess who bought them)We got a 3 seater cycle rickshaw back to our hotel, he had not a clue how to get to our hotel, just kept turning around and saying ok, ok thankyou to us funny to start with not after an hour later and atleast 7 stops for directions. Moving on to pushkar in the morning, this is where the camel fair is. very excited but know it's going to be crazily busy and packed with tourists.giot hotel booked though so feel better about that. Thanks for all your messages please jkeep them coming. loads of love, until next time.